Sunday, September 10, was C.S. Peirce’s birthday. He’s one of my heroes. He’s a treasure chest on essentially any topic, and anticipated quite a lot in statistics and logic. (As Stephen Stigler (2016) notes, he’s to be credited with articulating and appling randomization .) I always find something that feels astoundingly new, even rereading him. He’s been a great resource as I complete my book, Statistical Inference as Severe Testing: How to Get Beyond the Statistics Wars (CUP, 2018) . I’m reblogging the main sections of a (2005) paper of mine. 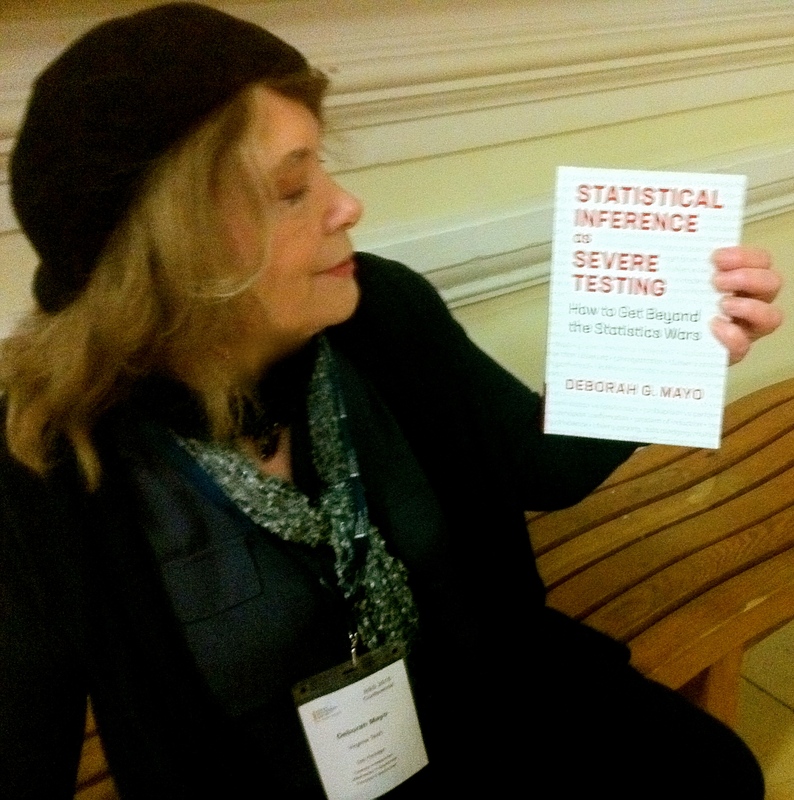 It’s written for a very general philosophical audience; the statistical parts are very informal. I first posted it in 2013. Happy (belated) Birthday Peirce. Self-Correcting Thesis SCT: methods for inductive inference in science are error correcting; the justification for inductive methods of experimental testing in science is that they are self-correcting. Peirce’s SCT has been a source of fascination and frustration. By and large, critics and followers alike have denied that Peirce can sustain his SCT as a way to justify scientific induction: “No part of Peirce’s philosophy of science has been more severely criticized, even by his most sympathetic commentators, than this attempted validation of inductive methodology on the basis of its purported self-correctiveness” (Rescher 1978, p. 20). In this paper I shall revisit the Peircean SCT: properly interpreted, I will argue, Peirce’s SCT not only serves its intended purpose, it also provides the basis for justifying (frequentist) statistical methods in science. While on the one hand, contemporary statistical methods increase the mathematical rigor and generality of Peirce’s SCT, on the other, Peirce provides something current statistical methodology lacks: an account of inductive inference and a philosophy of experiment that links the justification for statistical tests to a more general rationale for scientific induction. Combining the mathematical contributions of modern statistics with the inductive philosophy of Peirce, sets the stage for developing an adequate justification for contemporary inductive statistical methodology. For Peircean induction, as in the N-P testing model, the conclusion or inference concerns a hypothesis that either is or is not true in this one universe; thus, assigning a frequentist probability to a particular conclusion, other than the trivial ones of 1 or 0, for Peirce, makes sense only “if universes were as plentiful as blackberries” (2.684). Thus the Bayesian inverse probability calculation seems forced to rely on subjective probabilities for computing inverse inferences, but “subjective probabilities” Peirce charges “express nothing but the conformity of a new suggestion to our prepossessions, and these are the source of most of the errors into which man falls, and of all the worse of them” (2.777). Hearing Pierce contrast his view of induction with the more popular Bayesian account of his day (the Conceptualists), one could be listening to an error statistician arguing against the contemporary Bayesian (subjective or other)—with one important difference. Today’s error statistician seems to grant too readily that the only justification for N-P test rules is their ability to ensure we will rarely take erroneous actions with respect to hypotheses in the long run of applications. This so called inductive behavior rationale seems to supply no adequate answer to the question of what is learned in any particular application about the process underlying the data. Peirce, by contrast, was very clear that what is really wanted in inductive inference in science is the ability to control error probabilities of test procedures, i.e., “the trustworthiness of the proceeding”. Moreover it is only by a faulty analogy with deductive inference, Peirce explains, that many suppose that inductive (synthetic) inference should supply a probability to the conclusion: “… in the case of analytic inference we know the probability of our conclusion (if the premises are true), but in the case of synthetic inferences we only know the degree of trustworthiness of our proceeding (“The Probability of Induction” 2.693). Knowing the “trustworthiness of our inductive proceeding”, I will argue, enables determining the test’s probative capacity, how reliably it detects errors, and the severity of the test a hypothesis withstands. Deliberately making use of known flaws and fallacies in reasoning with limited and uncertain data, tests may be constructed that are highly trustworthy probes in detecting and discriminating errors in particular cases. This, in turn, enables inferring which inferences about the process giving rise to the data are and are not warranted: an inductive inference to hypothesis H is warranted to the extent that with high probability the test would have detected a specific flaw or departure from what H asserts, and yet it did not. 3. So why is justifying Peirce’s SCT thought to be so problematic? You can read Section 3 here. (it’s not necessary for understanding the rest). … [I]nduction, for Peirce, is a matter of subjecting hypotheses to “the test of experiment” (7.182). When, however, we find that prediction after prediction, notwithstanding a preference for putting the most unlikely ones to the test, is verified by experiment,…we begin to accord to the hypothesis a standing among scientific results. While these and other passages are redolent of Popper, Peirce differs from Popper in crucial ways. Peirce, unlike Popper, is primarily interested not in falsifying claims but in the positive pieces of information provided by tests, with “the corrections called for by the experiment” and with the hypotheses, modified or not, that manage to pass severe tests. For Popper, even if a hypothesis is highly corroborated (by his lights), he regards this as at most a report of the hypothesis’ past performance and denies it affords positive evidence for its correctness or reliability. Further, Popper denies that he could vouch for the reliability of the method he recommends as “most rational”—conjecture and refutation. Indeed, Popper’s requirements for a highly corroborated hypothesis are not sufficient for ensuring severity in Peirce’s sense (Mayo 1996, 2003, 2005). Where Popper recoils from even speaking of warranted inductions, Peirce conceives of a proper inductive inference as what had passed a severe test—one which would, with high probability, have detected an error if present. In Peirce’s inductive philosophy, we have evidence for inductively inferring a claim or hypothesis H when not only does H “accord with” the data x; but also, so good an accordance would very probably not have resulted, were H not true. In other words, we may inductively infer H when it has withstood a test of experiment that it would not have withstood, or withstood so well, were H not true (or were a specific flaw present). This can be encapsulated in the following severity requirement for an experimental test procedure, ET, and data set x.
Hypothesis H passes a severe test with x iff (firstly) x accords with H and (secondly) the experimental test procedure ET would, with very high probability, have signaled the presence of an error were there a discordancy between what H asserts and what is correct (i.e., were H false). The test would “have signaled an error” by having produced results less accordant with H than what the test yielded. Thus, we may inductively infer H when (and only when) H has withstood a test with high error detecting capacity, the higher this probative capacity, the more severely H has passed. What is assessed (quantitatively or qualitatively) is not the amount of support for H but the probative capacity of the test of experiment ET (with regard to those errors that an inference to H is declaring to be absent)………. In my understanding of Peircean induction, the difference between qualitative and quantitative induction is really a matter of degree, according to whether their trustworthiness or severity is quantitatively or only qualitatively ascertainable. This reading not only neatly organizes Peirce’s typologies of the various types of induction, it underwrites the manner in which, within a given classification, Peirce further subdivides inductions by their “strength”. Consider Peirce’s First Order of induction: the lowest, most rudimentary form that he dubs, the “pooh-pooh argument”. It is essentially an argument from ignorance: Lacking evidence for the falsity of some hypothesis or claim H, provisionally adopt H. In this very weakest sort of induction, crude induction, the most that can be said is that a hypothesis would eventually be falsified if false. (It may correct itself—but with a bang!) It “is as weak an inference as any that I would not positively condemn” (8.237). While uneliminable in ordinary life, Peirce denies that rudimentary induction is to be included as scientific induction. Without some reason to think evidence of H‘s falsity would probably have been detected, were H false, finding no evidence against H is poor inductive evidence for H. H has passed only a highly unreliable error probe. It is only with what Peirce calls “the Second Order” of induction that we arrive at a genuine test, and thereby scientific induction. Within second order inductions, a stronger and a weaker type exist, corresponding neatly to viewing strength as the severity of a testing procedure. The weaker type occurs where the predictions, though fulfilled, lack novelty; whereas, the stronger type reflects a more stringent hurdle having been satisfied: the hypothesis has had “novel” predictive success, and thereby higher severity. (For a discussion of the relationship between types of novelty and severity see Mayo 1991, 1996). Note that within a second order induction the assessment of strength is qualitative, e.g., very strong, weak, very weak. It is upon these and like passages that I base my reading of Peirce. A qualitative induction, i.e., a test whose severity is qualitatively determined, becomes a quantitative induction when the severity is quantitatively determined; when an objective error probability can be given. We enter the Third Order of statistical or quantitative induction when it is possible to quantify “how much” the prediction runs counter to what our expectation would have been without the hypothesis. In his discussions of such quantifications, Peirce anticipates to a striking degree later developments of statistical testing and confidence interval estimation (Hacking 1980, Mayo 1993, 1996). 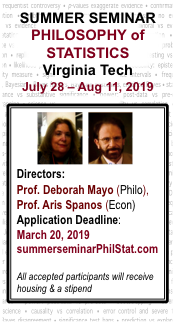 Since this is not the place to describe his statistical contributions, I move to more modern methods to make the qualitative-quantitative contrast. H0: there are no increased cancer risks associated with hormone replacement therapy (HRT) in women who have taken them for 10 years. p-value = Prob(d(X) > d(x)); H0). The reasoning is a statistical version of modes tollens. If the hypothesis H0 is correct then, with high probability, 1- p, the data would not be statistically significant at level p.
x is statistically significant at level p.
Therefore, x is evidence of a discrepancy from H0, in the direction of an alternative hypothesis H.
If a particular conclusion is wrong, subsequent severe (or highly powerful) tests will with high probability detect it. In particular, if we are wrong to reject H0 (and H0 is actually true), we would find we were rarely able to get so statistically significant a result to recur, and in this way we would discover our original error. The correction is not a matter of getting higher and higher probabilities, it is a matter of finding out whether the agreement is fortuitous; whether it is generated about as often as would be expected were the agreement of the chance variety. Stigler discusses some of the experiments Peirce performed. In one, with Joseph Jastrow, the goal was to test whether there’s a threshold below which you can’t discern the difference in weights between two objects. Psychologists had hypothesized that there was a minimal threshold “ such that if the difference was below the threshold, termed the just noticeable difference (jnd), the two stimuli were indistinguishable…. [Peirce and Jastrow] showed this speculation was false’ Stigler (2016, 160). No matter how close in weight the objects were the probability of a correct discernment of difference differed from ½. A good example of evidence for a “no-effect” null by falsifying the alternative statistically. Hacking, I. 1980 “The Theory of Probable Inference: Neyman, Peirce and Braithwaite”, pp. 141-160 in D. H. Mellor (ed. ), Science, Belief and Behavior: Essays in Honour of R.B. Braithwaite. Cambridge: Cambridge University Press. Laudan, L. 1981 Science and Hypothesis: Historical Essays on Scientific Methodology. Dordrecht: D. Reidel. Levi, I. 1980 “Induction as Self Correcting According to Peirce”, pp. 127-140 in D. H. Mellor (ed. ), Science, Belief and Behavior: Essays in Honor of R.B. Braithwaite. Cambridge: Cambridge University Press. Mayo, D. 1991 “Novel Evidence and Severe Tests”, Philosophy of Science, 58: 523-552. 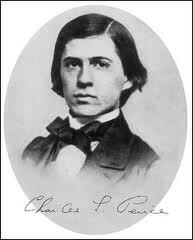 ———- 1993 “The Test of Experiment: C. S. Peirce and E. S. Pearson”, pp. 161-174 in E. C. Moore (ed. ), Charles S. Peirce and the Philosophy of Science. Tuscaloosa: University of Alabama Press. ——— 1996 Error and the Growth of Experimental Knowledge, The University of Chicago Press, Chicago. ———–2003 “Severe Testing as a Guide for Inductive Learning”, in H. Kyburg (ed. ), Probability Is the Very Guide in Life. Chicago: Open Court Press, pp. 89-117. ———- 2005 “Evidence as Passing Severe Tests: Highly Probed vs. Highly Proved” in P. Achinstein (ed. ), Scientific Evidence, Johns Hopkins University Press. Mayo, D. and Kruse, M. 2001 “Principles of Inference and Their Consequences,” pp. 381-403 in Foundations of Bayesianism, D. Cornfield and J. Williamson (eds. ), Dordrecht: Kluwer Academic Publishers. Mayo, D. and Spanos, A. 2004 “Methodology in Practice: Statistical Misspecification Testing” Philosophy of Science, Vol. II, PSA 2002, pp. 1007-1025. ———- (2006). “Severe Testing as a Basic Concept in a Neyman-Pearson Theory of Induction”, The British Journal of Philosophy of Science 57: 323-357. Mayo, D. and Cox, D.R. 2006 “The Theory of Statistics as the ‘Frequentist’s’ Theory of Inductive Inference”, Institute of Mathematical Statistics (IMS) Lecture Notes-Monograph Series, Contributions to the Second Lehmann Symposium, 2005. Neyman, J. and Pearson, E.S. 1933 “On the Problem of the Most Efficient Tests of Statistical Hypotheses”, in Philosophical Transactions of the Royal Society, A: 231, 289-337, as reprinted in J. Neyman and E.S. Pearson (1967), pp. 140-185. ———- 1967 Joint Statistical Papers, Berkeley: University of California Press. Niiniluoto, I. 1984 Is Science Progressive? Dordrecht: D. Reidel. Peirce, C. S. Collected Papers: Vols. I-VI, C. Hartshorne and P. Weiss (eds.) (1931-1935). Vols. VII-VIII, A. Burks (ed.) (1958), Cambridge: Harvard University Press. Popper, K. 1962 Conjectures and Refutations: the Growth of Scientific Knowledge, Basic Books, New York. Rescher, N. 1978 Peirce’s Philosophy of Science: Critical Studies in His Theory of Induction and Scientific Method, Notre Dame: University of Notre Dame Press. Stigler, S. 2016 The Seven Pillars of Statistical Wisdom, Harvard. [i] Others who relate Peircean induction and Neyman-Pearson tests are Isaac Levi (1980) and Ian Hacking (1980). See also Mayo 1993 and 1996. [ii] This statement of (b) is regarded by Laudan as the strong thesis of self-correcting. A weaker thesis would replace (b) with (b’): science has techniques for determining unambiguously whether an alternative T’ is closer to the truth than a refuted T.
[iii] If the p-value were not very small, then the difference would be considered statistically insignificant (generally small values are 0.1 or less). We would then regard H0 as consistent with data x, but we may wish to go further and determine the size of an increased risk r that has thereby been ruled out with severity. We do so by finding a risk increase, such that, Prob(d(x) > d(x); risk increase r) is high, say. Then the assertion: the risk increase < r passes with high severity, we would argue. If there were a discrepancy from hypothesis H0 of r (or more), then, with high probability,1-p, the data would be statistically significant at level p.
x is not statistically significant at level p.
Therefore, x is evidence than any discrepancy from H0 is less than r.
For a general treatment of severity, see Mayo and Spanos (2006). It turns out that I do not discuss Peirce’s self-correcting thesis in the book. However, I do offer my own answer to the question of “how to solve the problem of induction now”. Wrestling with the SCT in Peirce–an unsettled issue in philosophy–was definitely helpful in arriving at that answer.